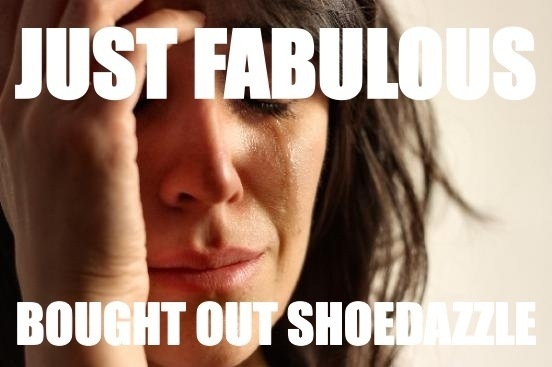 So earlier this year JustFab bought Shoedazzle. Good for JustFab, calamity for me. My fear with the acquisition was that since JustFab was the acquirer, Shoedazzle would turn into an extension of JustFab. It took a few months but sadly I believe I was correct. JustFab is “known” for their club shoes. Though I have purchased from them, for the 2 years I’ve been a member most of their shoes are unnecessarily platform. EVERY shoe doesn’t have to be a platform!!! This is coming from someone who is 5’6″!!! Also the quality of their shoes reminds me of ‘Rainbows’, and if you’ve ever shopped at a Rainbows, you know what I mean. I’m slowly seeing Shoedazzle’s variety morph into a cauldron of platform shoes. Currently Shoedazzle STILL has a better shoe selection, but I’ve been around my share of acquisitions to know that more times than not, it’s the acquired company that succumbs to the company that has acquired. I will keep my eyes out and though not rush to buy everything, in fiscal discretion, purchase shoes that would not only be a bargain, but as asset to my closet. It’s been a couple of months since your post… Do you still feel the same way? I’ve been a member at ShoeDazzle for a while and haven’t really noticed a whole lot of change aside from the membership structure. Haven’t tried JustFab myself but I do keep tabs on some of their social profiles. Their pinterest one in particular is pretty cool. Hey Rebecca!!! Though I’m still VERY happy with Shoedazzle’s variety of shoes, their shady get “you to VIP elite” tactics have me about to cancel my membership. I make sure to read everything carefully yet they cleverly disguised some clearance shoes as an upgrade to VIP elite. Needless to say once Elite you can’t return to classic. I’m not with the $40 a month thing so I am canceling. But I say still check out there shoes. And IF you were classic, try to stay classic as long as you can!! !